This month’s EcoRaider Interview is with Michelle Perkins, Executive Director of The Housing Authority of the County of DeKalb. Home to Northern Illinois University, DeKalb is about 75-90 minutes west of downtown Chicago. ECO: How much of a problem are bed bugs? MP: It’s a national epidemic and even though we are incredibly proactive and our pest control firm is great and they have great documentation sometimes you just have more reclusive tenants that keep to themselves or they have shame with the bed bug stigma so the only time we find out is when it traveled to another unit. We try to let them know it’s a part of quality living and it’s not about being dirty, it’s an issue and they were brought in from somewhere. Bed bugs will travel, they will hitchhike and it’s not that they have necessarily done something wrong. We’ve tried to demystify that. ECO: Is there any pushback from residents? MP: The biggest issue is trying to get them to comply. The procedures are somewhat complex when there’s an infestation so having the tenant bag everything in a clean bag put it in the free dryer to clean everything, and then put everything in a new clean bag while we’re working to get the unit decluttered – that is the biggest stumbling block. ECO: Where are most of the bed bugs found? MP: Definitely in the mattresses and you’ll find them in a Lay-Z-Boy or in couches. They’ll generally be there but they can hide everywhere: in dressers, cracks in wood, in outlets and they travel and hitchhike on shoes and backpacks on seats in theaters, planes and buses. Kids leave with backpacks and go everywhere with them and there’s all sorts of contact. When someone is suspected of bed bugs, either they’ll come notify us or our pest management professional will find it during an inspection and come tell us that they think we have a live situation and we’ll have to talk about treatment and go from there. Bed bugs can lay dormant for like 18 months without a blood meal so without a mattress encasement or getting rid of them completely, they’ll come back again. ECO: Are there any trends regarding bed bugs? MP: People are paying more attention now. We are in a college town and there’s lots of college housing and any multi-family housing that’s where you’ll see the problems. I know you see them in single-family homes but it’s a much bigger problem in multi-family units. The fact that the bed bug issue is being talked about in city codes and in the media, and tenants are complaining to landlords wondering who’s responsible who’s the bad guy … That conversation is continuing to be had as people are paying more attention to the issue. ECO: Do you use encasements? MP: Yes we purchased them on a grant and the residents could pay us back $10 a month and that would allow them to use it. It helped and they were happy about it and they wanted them. It’s a good thing to do too because it’s proactive. ECO: How important is it to have a Green or Natural bed bug solution? MP: It’s very important. We don’t use any chemicals. Green responsibility is something that’s incredibly important to us. Also so many tenants have sensitive needs like respiratory situations and some fear the chemicals so we have a handful of units that are literally designated as “no spray.” The heat treatment is not a full solution you have to be 100 percent prepared to fight bed bugs. You can apply heat in one part and green products in another but there’s no perfect solution. 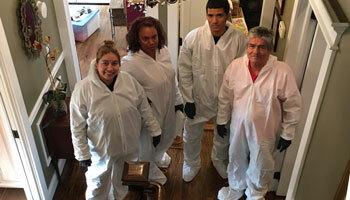 ECO: What advice would you give to a peer who handles bed bug situations at another housing authority? MP: The worst thing you can do is panic. Be diligent and open the lines of communication. If you panic you’ll set off all sorts of bells and whistles and that stops the communication and that’s the key to getting things done. You have to be diligent and follow up and stay on top of it. Arnold Castro is a true bed bug pest management professional – he works in the largest city in the country and the entire focus of his business is bed bug control. One of his largest challenges has been finding the right product to provide a great deal of bed bug control, while also providing a green, natural solution because that’s the focus of his Company, Ecology Environmental Professionals. One of his vendors recommended that he try EcoRaider®, a botanical bio-insecticide that delivers a fast, effective and green bed bug solution. Even more important, EcoRaider is all natural. “I focus on eco-friendly products and EcoRaider was superior to other products because it had so many more advantages than other standard products,” Castro said. “It doesn’t leave stains and we use it on everything: wood, plastic, any surface and it doesn’t leave a stain. Sensitive environments are very much a big part of Ecology’s business, specifically areas where most products cannot be utilized because of the active ingredients. “With EcoRaider, we use it in hospitals, clinics, facilities, offices, apartment buildings, homes, everywhere. EcoRaider works everywhere we use it. It’s very good for sensitive areas and that’s very important because you don’t want to treat a clinic or hospital knowing you’ll leave a dangerous residue on their premises. Castro relies on EcoRaider so much that he has his residential customers keep trial size products on hand to use for preventative measures.